Jeffrey Hinkle previously worked in landscaping and in an automotive garage, but he wanted to improve his life financially. 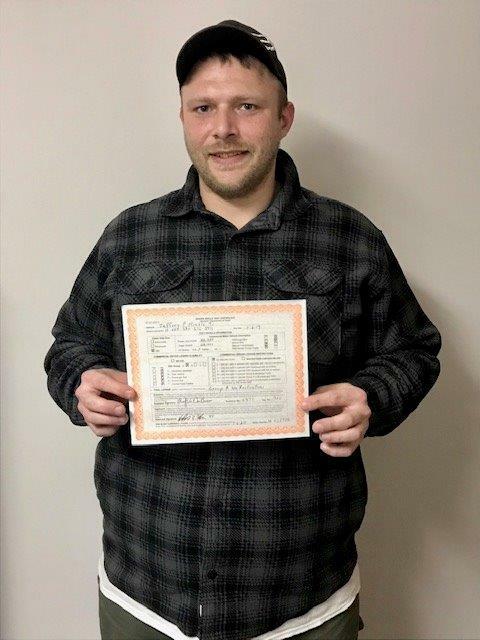 After assessing his likes/dislikes, he realized that he really wanted to see the country and that he also loves to drive, so he decided to pursue his CDL certification and become a truck driver. Unfortunately, at 28 years old, Jeffrey was still residing with his parents and not financially equipped to pay the costs of tuition. He came to Michigan Works! hoping to get some form of tuition assistance. Not only was Michigan Works! was able to pay the costs of the three week CDL program through Kirtland Community College, but they also helped Jeffrey pay for his required testing. Thanks to the help Michigan Works! was able to provide, Jeffrey is now able to pursue a career he will love. Jeffrey looks forward to seeing the country as an over-the-road truck driver and already has a job lined up with his uncle who owns a trucking line.